If your adult dog is a fit, healthy and a happy one plus-year-old, this is the dog food for him. Acana Classic Canine Prairie Poultry is loaded with healthy proteins that are delivered fresh to Acana’s kitchens daily. Dogs nowadays are built a lot like their ancestors, the Gray wolf, and Acana believes your dog should eat like your dog’s ancestors. The dog food is Biologically Appropriate and does not contain synthetic supplements. What is Acana Classic Canine Prairie Poultry? Acana Prairie Poultry is a delicious, high protein dog food for your adult dog from the age of 1 year. This product is delicious and has all the right ratio of ingredients to keep your fur friend healthy, happy and fit. All Acana foods are very high in protein, very low in carbohydrates and have just the right amount of vegetables, fruit and Botanicals. Which ingredients are used in Acana Classic Canine Prairie Poultry? Acana Classic Prairie Poultry is brimming with free-run chicken and turkey and nest laid eggs. There are only six supplements. Vitamins A, B5, D3, E, choline and zinc. Everything else your dog needs is supplied through the ingredients. From what age can my dog eat Acana Classic Canine Prairie Poultry? If your dog is one year and older, then, your dog can eat Acana Classic Canine Prairie Poultry. What does Acana Classic Canine Prairie Poultry contain? Acana Classic Canine Prairie Poultry is loaded with 50% meat, that’s up to twice as much as most speciality dog foods. Free-range Chicken – Wholeprey ratio – meat, liver, heart, kidney and cartilage. Free-range Turkey – Wholeprey ratio – meat, liver, heart, kidney and cartilage. There are no synthetic supplements in nature; wild animals get all their nutrition by eating whole prey animals; the muscle meat provides protein; liver, kidney and tripe give the vitamins and minerals, bones and cartilage deliver calcium and phosphorus. There are only six supplements that are added to Acana Classic Canine Prairie Poultry dog food, which is: Vitamins A, B5, D3, E, choline and zinc. Everything else is supplied from Acana’s ingredients. Botanical Inclusions are Chicory root, turmeric, milk thistle, Burdock root, lavender, marshmallow root and rosehips. What makes Acana different from other pet food companies? Champion Petfoods make Biologically Appropriate dog foods from fresh regional ingredients. Their mission represents a new standard in dog foods, designed to nourish them in two ways. Firstly, according to their natural evolution to a meat-based diet and Second, using ingredients that are sustainably raised and harvested by local suppliers and delivered to their kitchens every day. 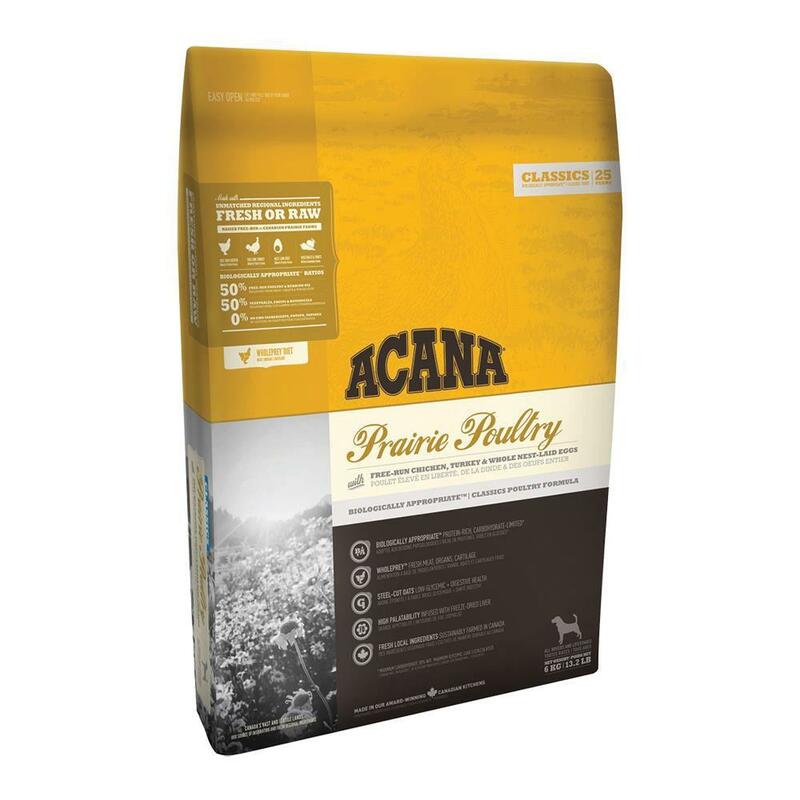 What is the best way to store your Acana Classic Prairie Poultry dog food? Always store your dog food in a cool and dry environment. Store the bag off the floor to reduce potential infestation. If you are using a bin or bucket, keep the pellets in the original packaging and store the whole bag in the bin or bucket, Do not empty the contents from the bag into the bucket. What are the package sizes available? Acana Classic Canine Prairie Poultry is available in a 340 g, 2 kg, 6 kg, 11.4 kg and 17 kg. Is Acana Classic Canine Prairie Poultry recommended by Vets? Acana Classic Canine Prairie Poultry dog food is recommended by Veterinarians. 50% Meat – loaded with protein Acana classic leads its class in meat inclusions, with all meat from animals deemed fit for human consumption. ⅔ is dried or oils, for a strong natural meat protein source. Fresh and local poultry, fish, meats – Chicken, turkey and eggs – free range on prairie farms. Limited carbs – contains few, if any carbohydrates. Only 5-6 supplements – Vitamins A, B5, D3, E, choline, zinc and copper. 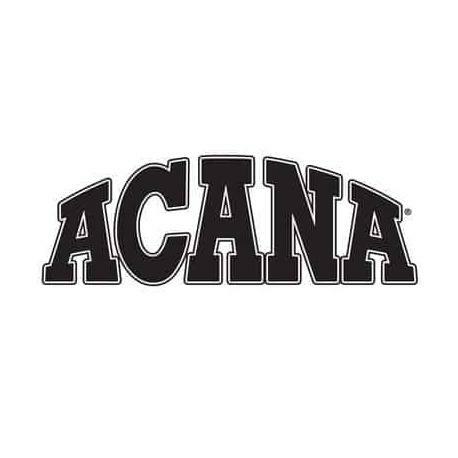 ACANA benefits dogs of all breeds. Just like you, your dog is unique with feeding requirements that vary with environment, age and activity.